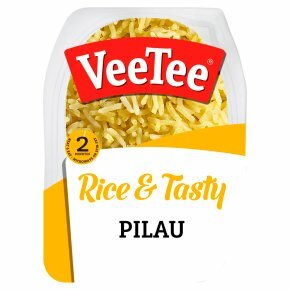 Microwaveable or stir fry in 2 minutesNo artificial flavourings, colours or preservativesSuitable for vegetariansPilau RiceWe understand cooking rice can be a chore, that's why we have done all the hard work for you.Rice so good, you will never need to cook it from scratch again. For best results microwave: Peel film back half way, microwave on full power Cat E - 800W for 2 minutes. Microwave ovens vary, adjust cooking times accordingly. Check the product is hot and fluff gently with a fork before serving. Alternatively stir fry for 2 minutes in a little vegetable oil. Do not re-heat.